Our fancy nightie slips are geared for people for whom form and functionality go hand in hand. The fabric is knitted to achieve total comfort and fit. There are many sizes available in this product. Every piece of our product gives a feeling of complete ease and desirability. In order to uplift our reputation among the clients across the country, we are devoted towards offering an elegant collection of Stylish Women Camisole Slip. 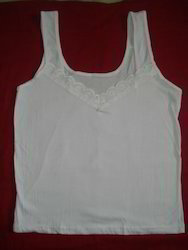 With the use of premium quality fabric and the latest designing techniques, we are coming out with this camisole and slip. Gown slip full size. available in colors ask for more detail.